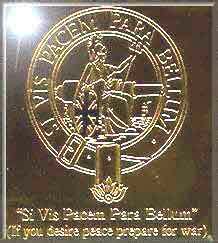 "If you desire peace prepare for war"
The Gunnery Branch's motif and motto. 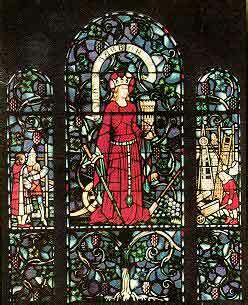 The only branch in the service to have its own Patron Saint Barbara, Patron Saint of Gunners. 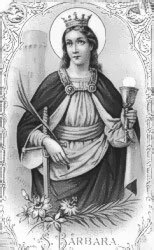 SAINT BARBARA - Patron Saint Of Gunners: A very popular saint in the Middle Ages, though it appears that she and her legends are wholly mythical. She is regarded as the patron saint of artillerymen and the chapel in HMS EXCELLENT Royal Navy (United Kingdom - Gunnery School at Portsmouth) is dedicated to her. The legend associating St Barbara with artillerymen says that her father was a chemist of the town of Hippo in North Africa who had learned the secret of gunpowder when travelling in the East; when Hippo was besieged by the Vandals in AD 430, she made bombards and other weapons. On his death, his daughter Barbara - who alone knew the secrets - left the convent where she was a novice and continued her father's work making explosives. When the town fell, Barbara blew up the convent and all its occupants rather than let them fall into the hands of the Vandals. Another legend has it that she was the very beautiful daughter (Christian) of a heathen Greek. Her father shut her up in a tower when he had to go away on a journey. Barbara had three windows cut in the bathroom of the tower, instead of the two her father had ordered. On his return this, together with her attempts to convert him to Christianity, infuriated him and he killed her with his sword. A flash of lightning devoured him forthwith and also the local Chief Magistrate who had connived at her death. For this reason, Barbara is invoked against lightning and fire and she is the patron saint of artillerymen. The Catholic Church Description is a little different..
Beautiful maiden imprisoned in a high tower by her father Dioscorus for disobedience. While there, she was tutored by philosphers, orators and poets. From them she learned to think, and decided that polytheism was nonsense. With the help of Origen and Valentinian, she converted to Christianity. Her father denounced her to the local authorities for her faith, and they ordered him to kill her. She escaped, but he caught her, dragged her home by her hair, tortured her, and killed her. He was immediately struck by lightning, or according to some sources, fire from heaven. Her imprisonment led to her association with towers, then the construction and maintenance of them, then to their military uses. The lightning that avenged her murder led to asking her protection against fire and lightning, and her patronage of firefighters, etc. Her association with things military and with death that falls from the sky led to her patronage of all things related to artillery, and her image graced powder magazines and arsenals for years. One of the Fourteen Holy Helpers. While there were undoubtedly beautiful converts named Barbara, this saint is legend, and her cultus developed when pious fiction was mistaken for history. Beheaded by her father c.235 at Nicomedia during the persecution of Maximinus of Thrace; relics at Burano, Italy, and Kiev, Russia. 'The guns of the main batteries were pointed through portholes. The lower tiers of guns pointed through square ports, fitted with heavy swinging port-lids. The upper tiers seem to have pointed through small round ports, not fitted with lids. The guns were mounted on four-wheeled wooden carriages which could be run out by means of side and train tackles attached to the carriages and ring bolts in the deck and bulwarks. To elevate and depress the gun, the gunner had to raise his piece by iron crows, or by wooden hand spikes, so as to thrust (or to remove from) underneath it, a wedge of wood known as a quoin. To load a gun, the gun's crew had first to run the piece in, so that the loader could pass the cartridge (usually made of flannel, canvas or parchment) down the muzzle. On top of the cartridge, a wad of oakum or rope yarn was rammed down, then the shot; and lastly another wad. the missile was generally a smooth ball of cast iron, kept (free from rust) in racks about the hatches and along the sides of the ship; but there were many varieties of bar, chain and hail shot, each with its special use, and the English gunners knew how to make and fire shells containing quickfire or other combustibles. When the gun was loaded, the gunner primed it. He thrust a wire down the touch hole, to prick the cartridge; and filled the touchhole with fine mealed powder from a horn which he carried in his belt. the gun was then run out by means of the side tackles. it was brought to bear upon the mark by the insertion or withdrawal of the quoin or by the slueing of the carriage aft or forward. When aim had been taken, the gunner took his linstock or wooden fork, about which his match was twisted and applied the burning end of the match to the priming in the touchhole. the gun recoiled violently, when fired; but the force of the recoil was checked by a stout rope called the breeching, which kept the gun from flying back too far. After each discharge it was sponged out with a sheepskin mop, sometimes wetted in ley. The guns did not fire very true, for the shot was always so much smaller than the bore of the piece thatit wobbled inside the gun, and made it impossible to aim exactly. Scales were cut upon the quoins, and perhaps upon the guns themselves, to help the gunner lay his piece with accuracy.Large guns were generally painted about their touchholes with the royal arms and the name of their ship. The largest gun in general use in the navy during the reign of Elizabeth 1 was the demi-cannon, which threw a ball of about 30 pound and had a range of about a mile. Nelson's chief weapon was the 32 pounder gun, which carried about a mile and a half, when elevated 10 degrees. The big muzzle loading guns could be fired about once every five or six minutes. The ships were generally mounted with more guns than they needed, and the excessive strain must have shortened their terms of service. The Royal Navy's sea victories in this reign were directly due to the comparative excellence in their sea artillery, and to their recognition of the fact that a warship is a movable battery rather than a floating parade ground or battering ram. Over the centuries Men O' War have been but mobile platforms for Sea Artillery, indeed England once ruled the greatest Empire the world has ever seen and this was due to the superiority of the Royal Navy and her excellence in Naval Gunnery. After centuries of loyal service, in the early 1990's, the Royal Australian Navy disbanded the Gunnery Branch and divided their duties and responsiblities between the newly formed Boatwain's Mate Branch, the Electrical Branch and the Coxswain's Branch. The Gunnery Branch, although noted for its conservative and disciplined approach to service life, regarded as the custodians of ceremony and tradition, it produced many characters and heroes and had a strong tradition. 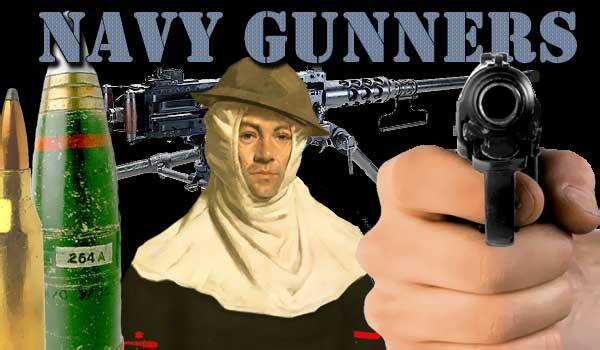 Gunners were truly an original part of navy life, for they were long in demand well before most other categories and branches were even dreamed of. Gunners were indeed the 'Senior Branch' within the 'Senior Service'. I suppose ever since the Israeli destroyer Ilyad was sunk by a Russian built Styx missile during the first days of the six day war in 1967, the powers that be put the Gunnery Branch on notice. Since then the Branch fought for its existance against the modern technology of Combat Data Systems and automation. Who knows the navy has become famous for 're-inventing the wheel' and just maybe one day the branch will rise again. Gunners duties were many and varied, indeed they all were 'cross rated' and multi skilled, as part of the 'Executive Department' in ships, Gunnery Sailors were also professional seamen. The gunnery sailor's job description encompassed nearly every aspect of service life. From training a Royal Guard for the Queen, to scullery hand in the Cafe, defending the ship from attack, to Coxswain of the liberty boat, and from replenishing a ship at sea, to preparation and implemantation of the ship's action, defence and cruising organisation. 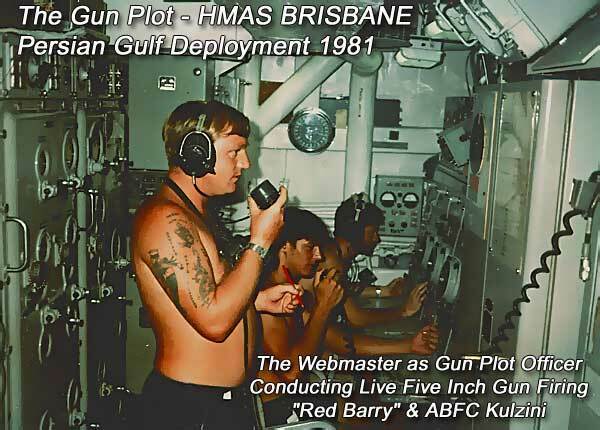 Above: Webmaster conducting live 5 Inch Gun Fire in HMAS BRISBANE's Gun Plot.